Size 4/6 - $40.99 Only 1 left! Why is pirating so addictive? They say once you lose your first hand, you get hooked! What do you call a pirate with two hands, two arms, two eyes, and both legs? A rookie! Had enough of our pirate jabber? We can never get enough good jokes! When pirates aren't making people walk planks they are having fun. Captain Hook may have been Peter Pan's nemesis, but that was just because he too always wanted to stay young to joke around. 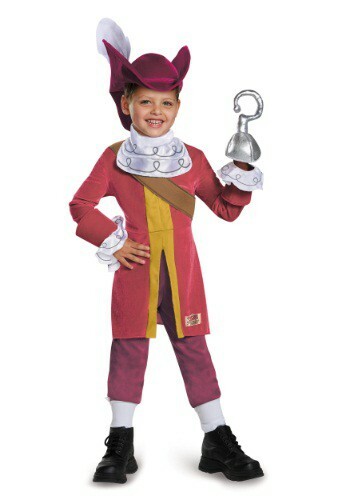 Captain Hook was really a kind-hearted guy deep down, he just liked swashbuckling more than being nice sometimes. Once you gain a hand for a hook it is hard to go back to petting kittens. That is why pirates always have birds as pets. They talk back, and you don't need to pet them all the time. They just sit on the shoulder of the pirate and keep him company. Your little one can be just like a pirate in the Toddler Deluxe Captain Hook Costume. The jacket fastens in the back with Velcro. In the pants there is an elastic waist, and the lower legs are cropped to look more historic. The hat is included and has a wire brim edge to shape as you see fit. The best part, the hook is soft-sculpted foam and has an elastic band for gripping. Set sail to new lands, and chase Peter Pan as the one and only Captain Hook!